In this tutorial we'll be looking at techniques for using textures and materials to create realistic objects. I'll be using 3D Studio MAX as an example but you can easily apply these techniques in any other package. You probably already know this but if you're serious about working with 3D you're going to need a copy of Photoshop. It's pretty much the standard package for creating maps. Some people prefer Painter and perhaps Paintshop Pro which I haven't used at all so I can't say whether they're as powerful. 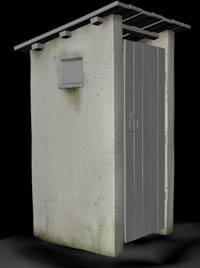 The model I'm working with is a simple little hut, chosen as it allows us to work with a variety of materials. First a few notes about the model. I've made use of bevels instead of extrusions, this gives me nice curved edges. There are no straight lines in this model, everything is slightly curved and in some cases I've used a noise modifier to break up the lines. I've not added any lights right now. 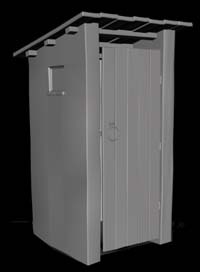 This allows me to check the textures in a neutral environment to ensure I'm not compensating for any lighting effects. 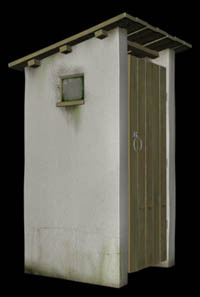 We're going to want to paint textures specific to various details on the building such as the window etc. Therefore painting any old texture and then tiling it all over isn't going to work. In Photoshop I painted a long wide texture made of 4 strips and then mapped it onto my building. Now we can paint a map for for the dirt and damage that is specific to each part of the hut. Sometimes it helps to have some reference so you know you're painting in the right area. 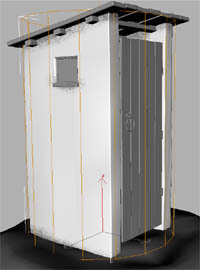 If so then render out a flat shot of each side of the hut with the stripped texture on .. you can then use these rendered images as position reference in Photoshop. 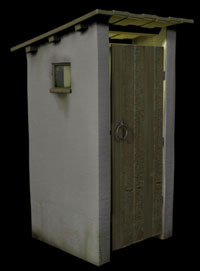 I made the above image by taking 4 rendered image (one of each side of the hut). Then importing each into the stripped texture image. Once each is lined up correctly you know have a perfect guide to where you should place your dirt and details. You can see I've made the white layer slightly transparent so i can see the coloured areas underneath. Once I'm happy I can make the white layer 100% opacity again and save the texture out as a copy. Here's the map tested in MAX to make sure my placement is correct. note : sometimes if I'm working with a more complex object I'll map a grid onto it and then use the position of the grid lines as reference in Photoshop when I'm painting detail. So now begins the process of painting our diffuse maps. 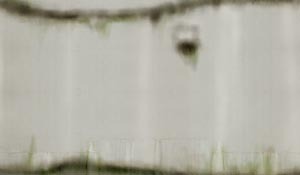 I took some photographs of walls and brought them into Photoshop. Using the clone tool you can pretty quickly turn a photo into a useful texture. I added a fair amount of green mould and grime, which was spread about with the sponge tool. The layers of green and black dirt where then colour burnt and multiplied into the basic texture. I've also added a brown layer with plenty of noise on it over the top of the entire map. this was all flattened down and used as the diffuse map you see above. So here's the basic hut texture. This is a simple combination of a bump map and diffuse map. Ok here's an admission of guilt - I based my wood texture on one of the maps that ships with max. The key word here is based as I repainted areas and made it fit the shape of my planks. I used the same map for both the diffuse and bump maps. Generally speaking you should avoid using standard textures as they're easy to spot. I used box maps to place the maps onto the planks. I then went through and randomly flipped and rotated them one by one to create some randomness so that the maps didn't all have that 'tiled' look to them. You can see in the above map that I've painted a small area of lighter colour around the edges, this doesn't always work in all cases but I find it simulates the extra wear and tear objects get around their edges, likewise with the darker patches. For the glass I want to simulate a weathered, scratched look. This is were Ben's Quick Scratches Method (tm) comes in handy. Overlay the top layer with the bottom and hey presto ! - scratches ! Use this as a shine or gloss map on metal and it'll suddenly bring it to life! For this application I'll use it to simulate the scratches on the glass. It's applied to the shine and gloss maps. I've also used it as a MASK for the reflection map, to do this select MASK as the map type for your reflection map, then use the scratches map as the mask and a REFLECT / REFRACT map as the map. now you'll find that the white areas are reflective and the dark areas shouldn't reflect at all. I've also applied a diffuse map with some green dirt around the edges. So you can see now it's all textured, only the metal areas left to do. I'll just whack some noise on their bump maps to simulate rust as they're going to be so far away from the camera. Always size your textures carefully - If the camera's going to get really close to the object then you'll need a good quality texture, however if it's likely to be a dot in the distance you can get away with a 200x200 texture. Noise is your friend! - Always apply some noise to your textures. 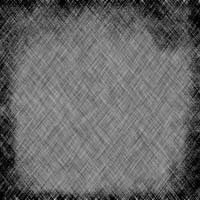 Explore the noise or procedural options within your 3D package as they are resolution independent meaning you can get as close as you like and they won't become all pixelated. Plus they generally render a lot quicker than a vast 2000x2000 TIFF file ! Observe! 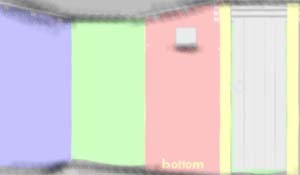 - Go outside look at stuff - see were dirt collects, what colour it is, how it looks in the light, is it matte or gloss?